MARION, Iowa (October 15, 2018)-To appreciate the true reach of Kirkwood Community College’s impact, one must look beyond the students attending the institution. For example, the Encore Café is one of many collaborative outreach programs offered by the Heritage Area Agency on Aging, a long-time department within Kirkwood. Heritage has been a part of the college since 1973 and was designated by the Iowa Department on Aging to serve Benton, Cedar, Iowa, Johnson, Jones, Linn, and Washington counties. The agency plans, funds, and coordinates a variety of human service programs that serve people age 60 and above as well as their families, communities, and governments. In addition, The Heritage Agency serves as an Aging and Disability Resource Center serving adults 18 years of age and older with a disability through advocacy and options counseling. 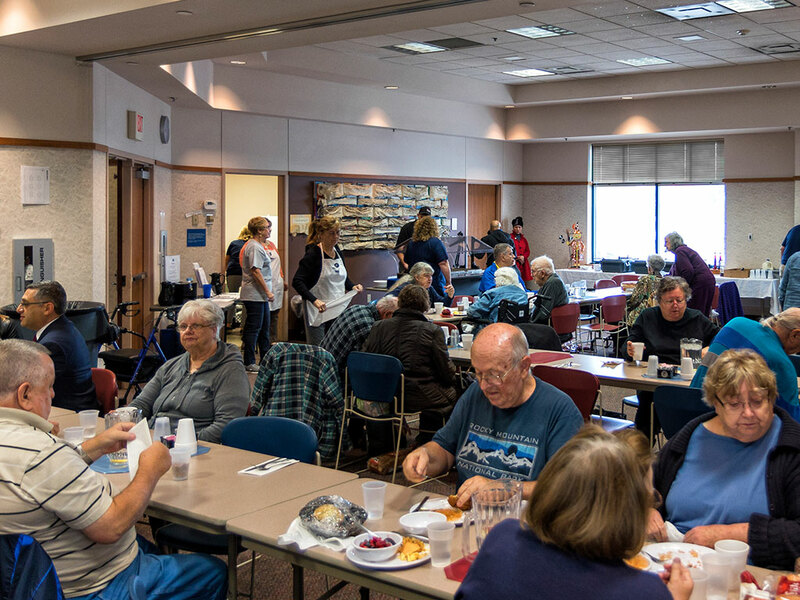 The Encore Café is a collaboration between the Heritage Agency, Marion city officials, Hy-Vee of Marion, and the Marion Public Library, which provides regularly scheduled meals to the elderly at the library as well as Lowe Park in Marion. The reason for developing this specific outreach program was the dramatic decrease in congregational dining opportunities, not only in Linn county, but the entire state of Iowa. Since opening its doors, the Encore Café has served over 3,000 meals in only 80 days. Aside from giving an aging population the chance to meet and converse with other community members, the program also provides one-third of the daily recommended nutrition an adult requires. On Friday, October 12, the Marion Public Library opened its doors once again to provide a meeting space for the Café, free of charge. Attendees gathered for a warm meal and good conversation as usual, but Friday’s Encore crowd was a little different. Saigon Superstar Entertainment & Productions, which is associated with film producer Chris Lee (Jerry McGuire) was on-site at the Encore Café to capture the incredible work being done. The crew’s primary goal was to capture how partnership formation and collaboration led to the Café, how they’ve continued to develop, and the impact they’ve had on the program. Once the crew captures all necessary footage they’ll produce a short documentary highlighting Heritage’s Encore Café, as well as an abbreviated version that will be leveraged to illustrate the value of the program to relevant governmental bodies. The Encore Café’s success may encourage additional locations across the country to mirror the model developed by Heritage’s Marion Encore Café locations. For more information on the Encore Café, as well as the Heritage Area Agency on Aging, go to http://heritageaaa.org.